The outgoing commander of US troops in Iraq, Gen David Petraeus, has said that he will never declare victory there. In a BBC interview, Gen Petraeus said that recent security gains were “not irreversible” and that the US still faced a “long struggle”. When asked if US troops could withdraw from Iraqi cities by the middle of next year, he said that would be “doable”. In his next job leading the US Central Command, Gen Petraeus will also oversee operations in Afghanistan. He said “the trends in Afghanistan have not gone in the right direction… and that had to be addressed”. Afghanistan remained a “hugely important endeavour”, he said. Earlier this week, President George W Bush announced a cut of 8,000 US troops in Iraq by February – with some 4,500 being sent to Afghanistan. Gen Petraeus took up his role in Iraq in February 2007, as President Bush announced his “surge” plan. He has overseen its implementation, including the deployment of nearly 30,000 additional troops to trouble spots in Iraq. In an interview with the BBC’s Newsnight programme, Gen Petraeus said that when he took charge in Iraq “the violence was horrific and the fabric of society was being torn apart”. Leaving his post, he said there were “many storm clouds on the horizon which could develop into real problems”. Overall he summed up the situation as “still hard but hopeful”, saying that progress in Iraq was “a bit more durable” but that the situation there remained fragile. He said al-Qaeda’s efforts to portray its jihad in Iraq as going well were “disingenuous”. It was, in fact “going poorly”, he said. Of his strategy of establishing joint security stations in key locations, Gen Petraeus said that “you can’t secure the people if you don’t live with them”. He said it was now fair to say that the Iraqis were standing up as US forces stood down. 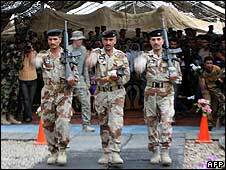 The confidence and capability of Iraqi forces had increased substantially, he said. Gen Petraeus did not confirm reports in the media that the US was preparing to withdraw all troops from Baghdad by next summer, but he did say that consideration was being given to removing US forces from a number of cities, including the capital. Watch the interview in full on the BBC’s Newsnight programme, BBC2, Thursday 11 September at 2230 BST.